Most of us desire to communicate effectively, but do not have a keen appreciation of the barriers to be faced. Because of these barriers, there is ample opportunity for something to go wrong in any communication. Competent managers develop an awareness of the barriers and learn to cope with them. The principal barriers to effective communication are: noise, poor feedback, selection of inappropriate media, a wrong mental attitude, insufficient or lack of attention to work selection, delay in message transmittal, physical separation of the sender and receiver, and lack of empathy or a good relationship between the sender and receiver. This guide examines each of these bar­riers and possible steps to overcome them. 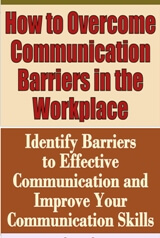 The principal barriers to effective communication are: noise, poor feedback, selection of inappropriate media, a wrong mental attitude, insufficient or lack of attention to work selection, delay in message transmittal, physical separation of the sender and receiver, and lack of empathy or a good relationship between the sender and receiver. Let's examine each of these barriers and possible steps to overcome them. As we conduct this examina­tion, we should remember that any two or more of these barriers may occur in combination. To bother one, without that stuff. Noise is any random or persistent disturbance that obscures, reduces, or confuses the clarity or quality of the message being transmitted. In other words, it is any interference that takes place between the sender and the receiver. This is why we generally identify any communica­tion problem that can't be fully ex­plained as "noise." The biggest single cause of noise in the communication process may be the assumption that the act of communicating is a simple process - that it doesn't require much thought or practice and all effective managers were born with this skill. This is not true. Effective com­munication comes with study and practice. The effectiveness of the communication process is dependent upon the capabilities of the senders and receivers. To overcome the noise barrier to effective communication, one must discover its source. This may not be easy. Noise appears in a variety of ways. During a conversation, have you ever been distracted by the pic­tures on the wall, the view from the window, a report lying open on a desk, or a conversation taking place in an adjacent room? Many people have been so distracted. In the perusal of a written com­munication, have you ever been confused by irrelevant material or the illogical approach taken by the author? Again, many people have. Once the source, or sources, of the noise has been identified, steps can be taken to overcome it. The noise barrier can't always be overcome but, fortunately, just the awareness of its existence by either the sender or the receiver of a message can help to improve the communication flow. Feedback is reaction, Without it, the sender of the message cannot know whether the recipient has received the entire message or grasped its intent. The need for feedback should be clearly understood. Feedback is the return of a portion of the message to the sender with new information. It regulates both the transmission and reception. The whole process is straightforward: the sender transmits the message via the most suitable communication media; the receiver gets the message, decodes it, and provides feedback. In oral, face-to-face communica­tion, the process doesn't happen quite this way. All of these actions occur almost simultaneously. For example, the sender is acting as a receiver while transmitting the message; the receiver is acting as a sender while receiving the message. When the message is transmitted and effectively received, feedback serves as a regulating device. The sender continually adjusts his transmission in response to the feed­back. Feedback also alerts the sender to any disruptive noise that may impede reception of the message. There is no feedback in a one-way communication. Such a communication involves passing ideas, infor­mation, directions, and instructions from higher management down the chain of command without asking for a response or checking to see if any action has taken place. It is not enough to ensure the message has been received. For communication to be effective, a two-way process must exist so the sender knows whether the message has been understood. The two-way communication process involves sending a message down the chain of command and transmitting a response containing information, ideas, and feelings back up the chain. This process has been referred to sometimes as "a process of material influence." Feedback not only regulates the communication process, but reinforces and stimulates it. In fact, it actually serves as the hallmark of dialogue, because it forces communication and makes it dual. Dual expression, when combined with mutual feedback, becomes a dialogue.